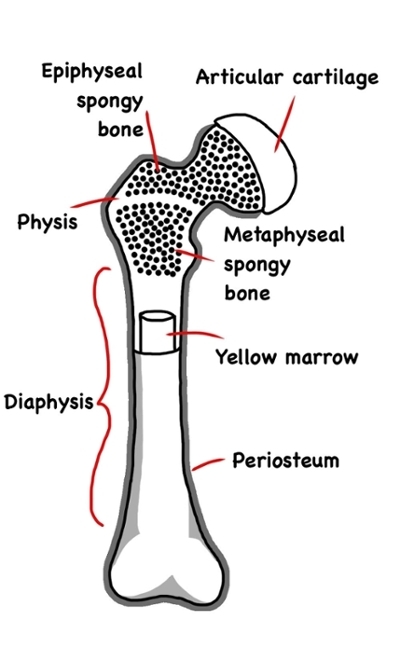 Fractures are described systematically. Start with the name of the bone, followed by the part of the bone. Long bones, as below, are described based on thirds (proximal, middle, distal). In pediatrics, fractures are described including the bone segments epiphysis, physis, metaphysis, and diaphysis. Keep in mind to include nearby anatomical landmarks (i.e. head, neck, body/shaft, base, condyle, epicondyle, trochanter, tuberosity, etc), when appropriate, to use as descriptors.